CITES #CoP17 – kicks off in South Africa! Geneva, 15 June 2016 – In exactly 100 days from today, the entire CITES community will gather at the Sandton Convention Centre in Johannesburg, South Africa, for the 17th meeting of the Conference of the Parties to CITES (CoP17) to be held from 24 September to 5 October. The upcoming CoP17 will be the largest ever CITES CoP. CoP16 in Bangkok in 2013 was the largest meeting of the Conference of the Parties up to that point in time. For CoP17, we have seen a 29% increase in the number of working documents submitted for discussion. This reflects the ever growing level of interest in CITES and its role in regulating legal trade in wildlife and wildlife products and combating illegal trade in wildlife. “CITES CoP17, or the World Wildlife Conference, is shaping up to be one of the most critical meetings in the 43 year history of the Convention and it is attracting massive interest from right across the globe. CITES has a long history of taking pragmatic and well-targeted decisions, going to a vote where necessary, and using compliance measures to ensure implementation of decisions. It is for good reasons regarded as one of the world’s most effective conventions and countries are increasingly utilizing this unique instrument” said CITES Secretary-General, John E. Scanlon. Mrs Edna Molewa, Minister of Environmental Affairs of South Africa, said “As the time draws near for the hosting in South Africa of the 17th Conference of the Parties to CITES (CoP17) we are excited that soon some of the world’s best minds in the conservation space will be in our country to learn, share experiences, and to chart a new way forward in the field of species conservation. When delegates to CoP17 visit our beautiful country they will be able to witness first-hand not only our country’s conservation successes, but also the ways in which we are bringing our people into the mainstream of conservation, thereby contributing to the social and economic development of communities." What is on the agenda for CoP17? 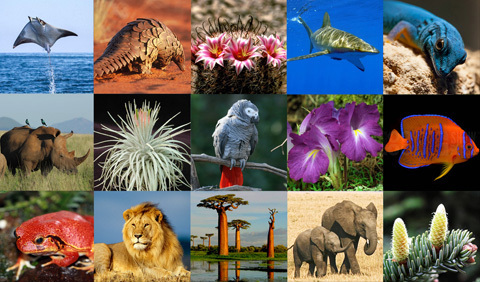 The CoP will consider 62 proposals to change the CITES Appendices, which list the species that are subject to CITES trade controls, including proposals to add additional sharks, rays and over 250 timber species – as well as proposals to increase protection for certain species already included under CITES, such as African grey parrots, African lions and all pangolins. There are also proposals to down list some species, such as the peregrine falcon, Florida puma and many crocodiles. The CoP will also address some difficult and contentious issues to do with divergent approaches amongst CITES Parties on matters affecting trade in elephants and their ivory, as well as rhino horn. The issue of sustainable use of wildlife and the livelihoods of rural communities is high on the agenda of CoP17 as well. This is addressed in the documents submitted on CITES and livelihoods, food security, establishment of the rural communities committee and trophy hunting. The Conference will consider a resolution for a fast and effective peer review process for checking on sustainability assessments made by Parties. Special measures are also being proposed to institute checks on whether or not specimens in trade claimed to have been bred in captivity really are so. The CoP will for the first time consider a draft resolution on corruption and wildlife crime and it is being asked to give further attention the work of the International Consortium on Combating Wildlife Crime (ICCWC). The CoP will also consider well targeted interventions to combat illegal trade as it affects a number of species, including elephants – noting the successes achieved through the use of CITES National Ivory Actions Plans (NIAPs) across the 19 key source, transit and destination countries, as well as cheetahs, rhinos, pangolins, totoaba fish, turtles and tortoises, tigers, rosewood and many more. In addition to enforcement related decisions and resolutions to combat illegal wildlife trade, the CoP will consider a powerful set of proposals concerning targeted demand reductions strategies and how to better engage with local communities to ensure they benefit from the wildlife they are living amongst reflecting the three-pronged approach taken under CITES to address poaching and wildlife trafficking. Many high profile, and smaller, events are planned around the CoP, including by international organizations, NGOs and philanthropic entities that are actively engaged in CITES issues. One high-proille event is the second global meeting of the world’s wildlife enforcement networks to be convened by the International Consortium on Combating Wildlife Crime (ICCWC), following the first meeting that it convened at CITES CoP16 in 2013. To date over 100 requests for side events on the margins of CoP17 have been received compared to 65 for CoP16 in Bangkok, and the number is still growing. Good news for philatelists at CoP17! There is good news for philatelists as well! The United Nations Postal Administration will for the first time issue its annual Endangered Species Stamps to coincide with a CITES CoP. This special set, titled “Eye on Africa” will feature 12 African species in the CITES Appendices and will be released together with CITES on 24 September at the start of CoP17. Ever wondered why the CITES CoP is also called the World Wildlife Conference? It is because the Plenipotentiary Conference, held from 12 February to 2 March 1973 in Washington D.C. where CITES was concluded, was called the World Wildlife Conference. We are keeping that tradition alive! In hosting CoP 17 South Africa also has the opportunity to showcase for the world its vast and wonderful wildlife and it conservation successes. “South Africa recently joined the global community in marking World Environment Day with its theme ‘Go Wild for Life: Zero tolerance for the illegal wildlife trade.’ Our national event was held in a province that faces numerous challenges with rhino poaching: and we showcased our government’s efforts in involving communities in wildlife management. In assisting to refurbish a community-owned lodge we are enabling previously disadvantaged communities to benefit from the wildlife economy. These initiatives form part of successful sustainable management policies that have resulted in us being one of the world leaders in conservation” added Minister Molewa. “We are very fortunate to have an extremely supportive and committed Host Government in South Africa and an extraordinary venue for the CoP, the Sandton Convention Center in Johannesburg. Participants can rest assured that all logistical arrangements will be well in place for the CoP enabling everyone to focus on the substance of this critical meeting on the future of the world’s wildlife” said Scanlon.